Announcement Hi, Welcome to Homegrown Glass Art, featuring the glass creations of Ryan and Daniel Eicher. All pieces are made from the highest quality materials and carefully annealed for strength and durability. We make a very wide variety of pendants, some styles just happen once, so get 'em while they're hot! Hi, Welcome to Homegrown Glass Art, featuring the glass creations of Ryan and Daniel Eicher. All pieces are made from the highest quality materials and carefully annealed for strength and durability. We make a very wide variety of pendants, some styles just happen once, so get 'em while they're hot! This item is GORGEOUS!! The colors just pop so brightly. It’s exactly as described but just sooo much more beautiful than can be seen in pictures! Even more beautiful when you get your hands on it and fast delivery. And makes a great gift too. Such a unique and color pendant! 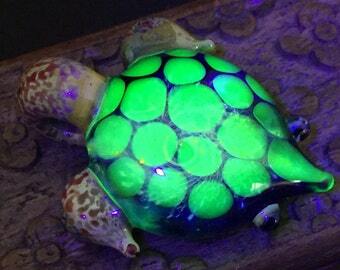 Love the cosmic turtle it's perfect!